What are the Best Online Roulette Sites? Spinning the roulette wheel has become synonymous with the concept of luck and chance. Roulette is a game that requires very little skill and can be understood in a very short space of time. As such, roulette has a significant share of followers in the gambling industry, both online and offline. 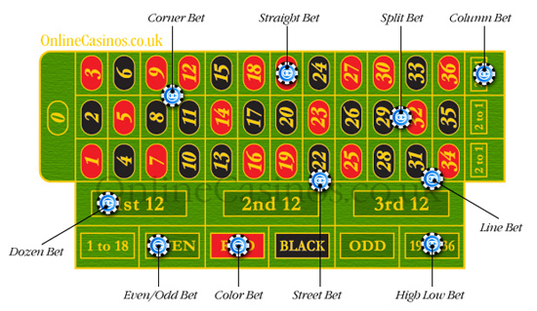 Players predict into which slot the ball will fall once the roulette wheel comes to a standstill by placing a wager. Payouts are according to a variety of correct predictions. Players place their bets on the roulette table. The croupier announces that there are no more bets to be had. The wheel is spun and the croupier throws the ball into the spinning wheel. Winning numbers are isolated on the roulette table. The croupier clears the table of all losing bets and pays out all winning wagers. The roulette wheel is divided into 37 or 38 slots (depending on whether European or American roulette is being played). The slots are numbered one through to thirty-six, plus an extra zero (European roulette) or O and OO (American roulette). The zero slots are colored green, while the number slots are colored black and red. The slots are placed on the wheel in a pattern that alternates between pairs of odd numbers with pairs of even numbers, as well as alternative colored slots. During the process of the roulette game, the wheel is turned and a ball is thrown into this cycle. When the ball falls into a slot containing a certain number, that number is what determines the payouts in the game. As can be seen, there are a variety of ways to bet at roulette although all bets in the game are divided into inside and outside bets. Inside bets constitute, among others, straight bets (one specific number will appear on the wheel; pays out 35:1); split bets (one of two adjacent numbers will appear; 17:1); five number bets (0, 00, 1, 2 or 3 will appear; 6:1). Outside bets, on the other hand, include bets such as a column bet (a number in a specific column will appear; 2:1); red bet (the ball will fall on a red number; 1:1); odd bet (the ball will ball on an odd number; 1:1). There are a number of rules pertaining to roulette that may or may not be included in the game, depending on which casino the game is being played out at. The most common rule is known as ‘en prison’ which states that if the ball falls on a zero, the player can take back half the bet or leave the money ‘in prison’ for another spin. The player loses the wager if the next spin produces another zero. This rule only applies to European roulette. Another similar rule is ‘la partage’, only the bet cannot be left for the next spin.